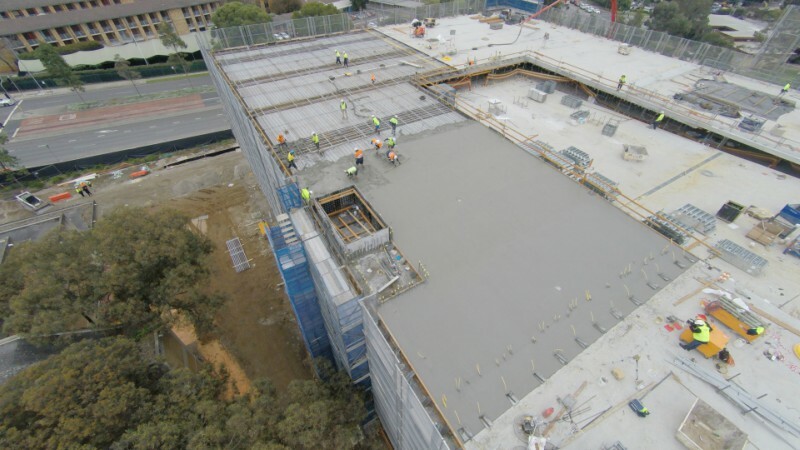 Aerial shot of last concrete pour on multi-storey car park at Westmead Hospital. Westmead Hospital is on track to open its new multi-storey car park later this year, following the completion of construction work on the facility this week. Builders officially poured the last slab of concrete on the car park today, signalling the end of more than 12 months of construction and 10,200 cubic metres of concrete poured – that’s 1700 truckloads! Work will now begin to prepare the inside of the car park, which will accommodate 1250 car spaces for patients, visitors and staff. The eight-storey car park will also include a new, light-filled overhead walkway, connecting the car park to Westmead Hospital, along with landscaped green space and improved lighting and security. The work is part of the Westmead Redevelopment, which includes $72 million for improved car parking facilities across the precinct. Westmead Hospital acting general manager Jude Constable said the car park was a welcome addition to the precinct and will accommodate the hospital’s current and future parking needs. “We wanted to create a workable, long-term solution for car parking across the precinct to ease parking stress,” she said. The new car park is part of the Westmead Redevelopment’s efforts to manage traffic across the precinct, which has included several new open-air car parks for Westmead Hospital and The Children’s Hospital at Westmead staff. Ms Constable said new parking infrastructure was just one part of a broader transport plan. “The transport solution isn’t just about car parking; it’s also about assessing rail and bus routes and walking and cycling networks, the introduction of light rail, as well as looking at our connections to Parramatta CBD and major roads,” she said. The $900 million Westmead Redevelopment is NSW’s biggest health development project. It includes a new hospital building, to open in 2020, which will include two new emergency departments – one for adults and one for children – along with state-of-the-art operating theatres, inpatient beds and clinical support services. Other important elements of the redevelopment include infrastructure upgrades across the precinct, a staged refurbishment of Westmead Hospital, and the University of Sydney’s $500 million investment to improve education and research facilities and expand education, training and research initiatives at Westmead over the next 15 years.